There are competency tests for almost everything, but not for matters that are closest to the heart. Personal prayer is not tested. It requires no certification. Nevertheless, it still requires sufficient preparation. There’s evidence for it in the beginning of this week’s Torah portion, Va’etchanan, from Deuteronomy. It begins, “Va’etchanan el Adonai” I pleaded with the Lord. Moses pleaded with God. The Hebrew word, Va’etchanan, written in a reflexive grammatical form means that Moses’ pleading began on the inside. Moses prepared himself. Rabbi of Tsans used to teach, “Before I begin to pray, I pray that I may be able to pray.” To him, the efficacy of his prayer was at stake. If we understand the Hebrew word Va’etchanan correctly, the stumbling block to prayer isn’t the prayer, itself; more often it’s us. The liturgy has structure that enables us to succeed in our prayers. When we participate, even slowly at the start, we can begin to feel its purpose emerge. Understanding comes through doing; and, the rabbis and cantor lead the way every week. When we arrive in the chapel or sanctuary, I welcome you. I often begin by acknowledging our joys and challenges this past week. I suggest that the words we recite and the songs we sing can help us find what we need to express gratitude for our joys and know consolation in our sufferings. Alternatively, I invite you to set aside your challenges for an hour of peace and reflection as we share our prayers, together. Then we sing. Cantor Mutlu’s choices unite us as a worshiping congregation. A “niggun”, a song without words invites us to let go. We hum and engage. Next, a song for Shabbat turns ordinary time into sacred time. Candle lighting follows to usher in the Sabbath for us visually and spiritually. Our collective deep breath precedes Barechu, our call to worship. It says, “God, we’re ready to pray.” The prayer service unfolds as we’re guided through a retelling of our people’s relationship with God via the themes of creation, redemption, and revelation. Though we have been educated otherwise, the Shema is not the peak moment of the worship service. 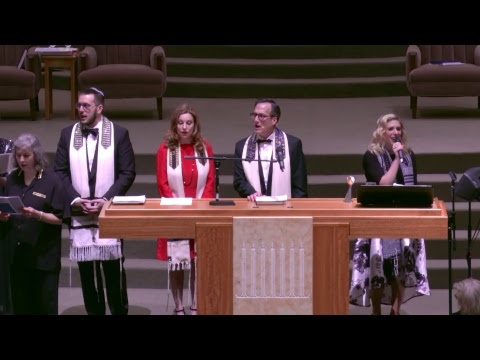 Reform Judaism elevated the importance of Shema by calling it the “Watchword of our Faith” and inviting the congregation to rise while reciting it. The real peak of the worship service is the Amidah, also known as HaTefilah, or “the prayer.” Amida means standing. At this high moment of the service we stand. In a traditional setting, the Amidah is done twice, silently and aloud. The Reform goal and accommodation was to eliminate repetition, but to make room for silent personal prayer. Thus, after the Amidah, we’re seated and invited to pray silently. The conclusion of the service includes the Aleinu and Kaddish. And, naturally, a closing song allows us to be a congregation one more time before we become many individuals again. Effective worship can meet many personal spiritual needs. Hundreds of people who attend or livestream with us agree that their weekly rhythm is enriched by communal prayers we sing and read. When we feel successful in our prayers it affects everything else about us. It can help us find courage when we feel defeated; know hope when we feel despair; feel humility when we are arrogant; and, grant us peace when we feel unsettled. We wish the feelings would linger for a while. They do. But, better they should come and go, so we can search for them again every day and every Shabbat. Let’s begin. May we pray that we are able to pray.